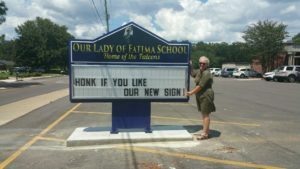 Thanks to our fund raising efforts and a donation from Scrips, Our Lady of Fatima Elementary School has a new marquee on Jim Money Rd. The new marquee will help keep parents and the local community updated on events happening at the school. “One of the suggestions from our parent survey last year was to improve communication with the parents. We believe the new marquee will help keep parents updated on big events upcoming at the school” said Cindy Hahn, principal of OLF. Ms Hahn shows off the new sign. Be sure to Honk! !